If you want a car that burns 20 percent to 30 percent less fuel than a standard gasoline engine with little sacrifice in performance, forget hybrid -- think diesel. Now before you write off diesel engines as the overpolluting, underperforming beasts of the 1970s, give the new generation a look. Beginning with the 2008 model year, a slew of carmakers are planning to unveil a new generation of diesel vehicles that run clean, are powered by peppy turbocharged engines, sip fuel and routinely run for hundreds of thousands of miles without significant engine work. While diesel as a green alternative to gasoline may be a new concept for Americans, these new diesel engines are old hat in Europe, commanding around 50 percent of their automotive market. That is a far cry from the 3.2-percent share of vehicle sales diesels get in the United States. But, according to an analysis by J.D. Power and Associates, that is about to change. They predict the diesel share of U.S. light-vehicle sales will more than triple to about 10 percent of sales by the middle of the next decade. Part of the reason Americans drive fewer diesel vehicles than Europeans is because of a stigma earned by earlier diesel models. As a rule, when most U.S. car buyers think diesel, their skin crawls. That's because the first attempt to introduce these engines was such a failure. "In the '70s and '80s we tried to like it, we didn't, and we rejected it," says Philip Reed, consumer advice editor for automotive resource Edmunds.com. "But now we are looking at another cycle of diesel engines trying to crack our market." Led by European giants Mercedes-Benz and Volkswagen, carmakers first tried introducing Americans to diesel engines during the 1970s gas crisis. Because it is less expensive to refine, and because the high-compression engines burn fuel much more efficiently than gasoline engines, policymakers thought diesel would be a surefire way of easing the pain at the pump. Unfortunately, with the gains those first generation engines offered in fuel savings, they also spewed clouds of soot, smelled awful and struggled to climb even the smallest of inclines. "Because of that, when people think diesel, they think of a bus. They think of the old cars covered in soot from their own tailpipe," says Jonathan Linkov, managing editor for autos at Consumer Reports magazine. Within a decade, nearly every carmaker abandoned their diesel experiments and left the fuel to only the large truck market and the few passionate believers who stuck with their trusty diesel-powered cars. For the next 10 years or so very few manufacturers marketed diesel-powered cars in the United States, says Kevin Riddell, automotive analyst for J.D. Power and Associates. "VW was a great example," he says. "They had diesel on the market for several years, and without a significant amount of advertising, they have cultivated a dedicated group of enthusiasts among their drivers who continued to buy their TDI diesel cars." If preconceptions about diesel were a gut punch for the fuel, California's strict emissions requirements delivered the knockout. Those rules, which were adopted by several other states, prohibited any new sales of the old-style diesel engines because the soot they belched turned out to be a major smog producer. "Without California and the states that follow their rules, automakers were locked out of a huge part of the market," Linkov says. By the 2007 model year, all but a tiny handful of new diesels were finally pulled from the market. But that didn't mean the manufacturers were abandoning the technology. Rather, Linkov says, they were redesigning their engines to comply with the strict air pollution rules. "At this point, the U.S. is essentially a completely virgin market for diesel," Reed says. J.D. Power and Associates expects Volkswagen to remain the largest global supplier of diesel-fueled light vehicles in the coming years, followed by Ford Motor Co. and Mercedes-Benz. With pioneering engine technology and a new ultralow sulfur blend of diesel fuel -- mandated by the Environmental Protection Agency -- which became available in most areas, last year, carmakers think this is the time to try another push into the diesel market. Taking advantage of the cleaner fuels, manufacturers have come up with a few tricks to make their engines clean enough to pass the California standard. 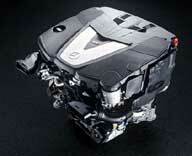 For example, Mercedes' engine uses a urea-injection system to capture the soot and scrub out the exhaust. The urea is a liquid that must be replenished at every oil change. Urea is a nitrogen-rich, synthetically produced organic compound. Commercially it is used as a chemical foundation for things like fertilizer, cleaning solvents, and in this case, exhaust scrubbers. Urea injection, also called Selective Catalytic Reduction, or SCR, involves squirting urea into a special catalyst to reduce emissions of oxides of nitrogen. Volkswagen took a different approach. Instead of scrubbing their exhaust with a liquid, they designed a trap that captures the particulates before they are released into the air. Then, when the trap gets near to being full, the car's computer changes the fuel mixture to run hotter and the particulate is dumped back into the engine, incinerating the pollutants. "People need to realize this is not your grandfather's diesel," Linkov says. One way automakers plan to get the word out about these new engines is by introducing them first in their luxury line, Riddell says. "They hope this will market them as a desirable product and help their image in the U.S. market." Reed says that in addition to being cleaner, the new diesels he has tested also aren't plagued with the sluggishness of their predecessors. "They drive slightly differently than gas, but most of them are turbocharged to give them the more car-like feel we are used to," he says. "They are much closer to what we expect." One of the biggest selling points for these new diesel cars is the fuel-efficiency. "VW has done well with their TDI," Reed says. "Those vehicles will get 40-plus miles per gallon on the highway. The real-world mileage of a Prius is 43 miles per gallon. That's not a whole lot more." EPA estimates show the Prius is capable of 48 miles per gallon on the highway, but Reed says tests performed by Consumer Reports and other laboratories show the actual mileage is lower. And while hybrids cost between $3,000 and $4,000 more than a comparable gasoline-powered car, the new diesels cost only about $1,000 more than a similar gasoline car. For example, according to Edmunds.com, a 2007 Mercedes-Benz E-Class midsize sedan with a Bluetec diesel engine costs $51,550. The gasoline version costs $50,550. According to Edmunds.com estimates, the diesel gets an estimated 26 miles per gallon in the city and 35 miles per gallon on the highway, burning an estimated $1,343 a year in fuel. The gas version gets 19 miles per gallon in the city and 26 miles per gallon on the highway, burning an estimated $2,093 per year in fuel -- $750 more than the diesel. And the savings don't stop at the fuel pump. According to Edmunds.com, the diesel version depreciates $500 less in that first year, meaning the $1,000 premium is more than repaid in fewer than 12 months. What's more, over five years, the diesel cost an estimated $4,400 less to own than its gas-powered cousin, according to Edmunds.com's "True Cost to Own" estimates. "It is slightly more expensive than a gas-powered car, but we are talking about such a quick payback period, it makes that premium seem less significant," Reed says. By comparison, even with federal tax incentives, hybrids take several years to overcome the premium you pay over a traditional gas-powered car. Something to keep in mind, though, is that while a diesel can hold its own alongside a hybrid for highway driving, in the city it is no contest. The EPA estimates that same Prius that got 43 miles per gallon on the highway will get a jaw-dropping 60 miles per gallon in the city, blowing away even the most miserly diesel. Another trend making diesel cars popular among the environmentalist crowds is the increasing availability of biodiesel. Biodiesel is a blend of petroleum-based diesel and a refined vegetable oil -- typically soybean oil. Marketed as B5 or B10, meaning 5 percent or 10 percent vegetable oil, nearly every manufacturer has approved the fuel in their diesel engines. What's more, the biodiesel burns at a much higher efficiency rate than ethanol. This is attractive both to the environmentalists who advocate less carbon emissions, but also among many right-wing advocates who wouldn't otherwise align themselves with the green movement, but who want to push for less dependence on foreign oil. Hobbyists and do-it-yourselfers have found an even less petroleum-dependent solution with their diesel-powered engines. Some are buying equipment to manufacture small batches of biodiesel at home by combining waste vegetable oil from restaurants and another fuel stock, typically methanol. Others are converting their diesel engines to run completely on waste vegetable oil. And while both methods could yield some fuel savings -- often just pennies per gallon -- using anything except diesel or biodiesel marketed by a traditional gas station may raise the ire of the automakers. "The manufacturers really don't like that," Linkov says. "Using those homemade options will typically void your warranty." Because of that, most people tinkering with vegetable oil-based fuels are doing so with older models. "You don't think people will do that with their $60,000 Mercedes-Benz," Linkov says. One problem plaguing biodiesel, and to some extent, traditional diesel fuel, is the lack of availability. While diesel isn't nearly as hard to find as its biodiesel counterpart, it certainly isn't available at every corner gas station. On the other hand, diesel is becoming more universally available than in years past. Reed likened the problem of finding diesel to the quest many people go on to find the best deal on gasoline. If you are near your home, you will know which stations offer it, but it may be a slight problem in a strange part of town or on a road trip. But, on the bright side, when you do find diesel, it has tended to be less expensive than gasoline over the past year or so. Energy Technology Group Pinnacle Fuel Supplement provides the best protection for Lubricity, Anti-Gel, Water Dispersion, Cetane, Fuel System Cleaning, Corrosion Inhibition, Thermal Stabilization, and an Anti-Oxidant. Pinnacle Fuel Supplement is the environmentally friendly all-season, year-round additive for all diesel fuels and is enhanced for Ultra-Low Sulfur Diesel. It provides no additional sulfur and is safe to use with all engines and emissions devices.